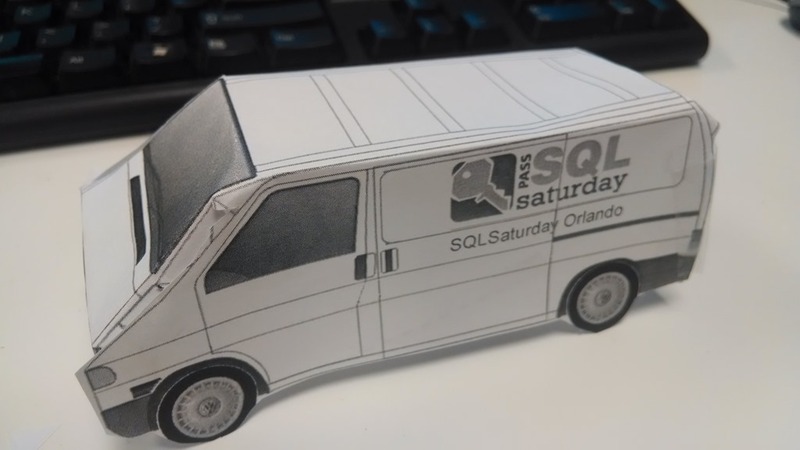 We’re Giving Away SQLSaturday Orlando Vans! We’re in full marketing mode here in Orlando, looking for ways to grow attendance for our next SQLSaturday coming up on September 27, 2014. What better way to spark some interest than an over the top post about giving every attendee a free SQLSaturday van? I found this design on Fiverr and for $5 they added the logo, sending back the jpg below and this PDF version that you can download and print. The designer recommends matte photo paper for best results, but I tried it on plain copy paper in b&w and in less than 10 minutes I had my van (this one with the optional roof sign – that space will probably go to a sponsor! Other options include a shipping container, a bus, and UPS style van – see them at http://www.fiverr.com/papertrucklogo. I’ll have follow up notes on this in my next marketing post. *Disclaimer – The van we’re giving away is the paper one you print, not a “real” van.